I can’t believe it – my little Lia turns 4 this weekend! I still can’t get over that she’s 4 years old. Next year means she’s 5 and she’ll be starting Kindergarten. I’m not ready! In honor of her 4th birthday, we grabbed two beautiful party dresses that she’d been given by a friend and went out for a tea party at a near by park. Warning: this is a very picture heavy post. #Sorrynotsorry. I know you’ve seen a ton of her – I may as well rename this to the Lia Blog for as much as I show here here. 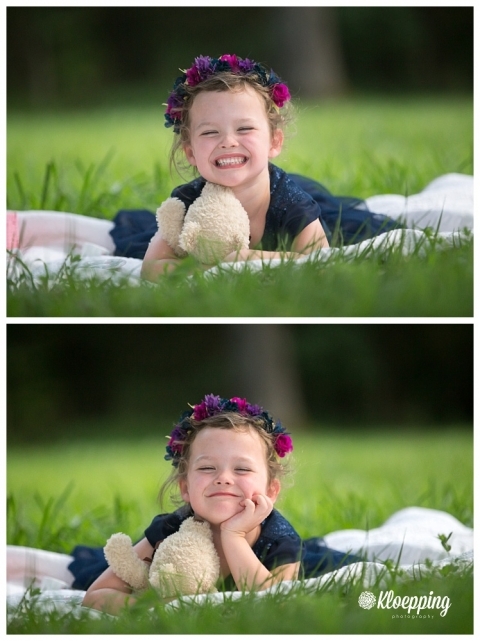 But it’s because she makes it so easy (and she’s mine so I don’t need a model release to show her on the blog:) ). Half the time she suggests we go out and the rest are at my suggestion. Almost always she’s in charge of the outfits and I definitely let her contribute to the theme/props. She loves to go down to my prop corner and pick out things to take with us. There is a small nosegay of flowers that she almost always wants to include. I had to talk her out of it for this one since it didn’t work with the color dresses we had. No worries, we just added in the teddy bear instead. I love this location because it has so many options. There’s a massive beautiful tree in the middle of an open field, a great stacked wood fence, stone wall and a building with doors and brick and just so many options. Plus, right across the street is a beautiful open field that with a little creative positioning, you can avoid the powerlines and the road! 4 is such a fun age, especially with Lia. She’s such a girlie girl that mothers her dolls, plays dress up, likes dresses that twirl, and is excellent at make believe. But then she’s has a pretty thick streak of tomboy in her. She loves sports, climbing, getting dirty, and just generally getting into things. She follows her brother around and wants to do everything that he does (much to his annoyance). When she’s done playing hard she’s ripe for a cuddle or two. She’s sweet and caring and would rather sleep in your lap than anywhere else in the house. 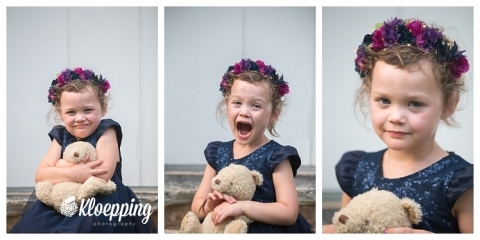 It shows in the photos that she’s silly and sweet and always trying to crack us up! The things she cooks up in her little head amaze me every time. She’ll sit and have a tea party with her animals for hours. They have conversations, drink pretend tea and bond. Then she looks at me and says “it’s only pretend mommy, there’s no tea in here”… Her grasp of the world around her is far beyond what I expected of a 4 year old. These last few are perhaps my favorite of the set. In the first I was trying to get her to curtsey – 4 year olds lack the coordination to curtsey fyi…we stuck with a cute toe pop instead.